Images, objects, and perceptions from the early days of the Space Race. A consideration of one object and two seemingly unrelated series of photographs from the early days of the Space Race reveals a sudden transition in mankind’s perception of outer space. In an ambitious photographic sky survey, the universe is a subject of de-aestheticized, scientific, earthbound observation. But as the launch of Sputnik heightened the Cold War’s contentious dynamic, the U.S.’ aggressive and highly visual response transformed space into a site of military, political, and cultural activity—with ourselves as the subject. On January 20th, 1949, six days before the Palomar Observatory's 200-inch telescope went into operation, astronomer Edwin Hubble and Caltech administrator G.H. Hall discussed the creation of a sky atlas, a complete photographic survey of the sky, which scientists would use to identify potential targets for observation. (1) The National Geographic Society agreed to underwrite the project, which was projected to take four years. It took nearly nine. To make the NGS-Palomar Observatory Sky Survey (POSS), the universe (or the northern three quarters of it visible from California, from 90 to -45 degrees latitude) was gridded into 6-degree sections and photographed in two wavelengths, red and blue, using Palomar's 48-inch Oschin Schmidt telescope. Rudolf Minkowski, a German refugee astronomer who fled Nazi persecution in the late 1930s, oversaw the POSS, taking and inspecting every one of the 1,620 exposed pairs of glass plates required to obtain 935 acceptable pairs in the final Survey. The POSS plates are among the most technically and conceptually sophisticated photographs ever made. Prolonged exposure meant they were able to capture objects one million times fainter than the limits of human vision. The resolution of the Survey was ultimately determined by the plates’ photographic emulsion, a hypersensitive spectroscopic formulation developed in consultation with Kodak. According to Dr. Minkowski, “No known reproduction method can reproduce on paper the full density range obtained on a photographic plate.”(2) To minimize loss from generations of photo reproduction, glass contact positives were produced for each plate, which were used to print complete sets of contact negatives. These black-on-white negatives also turned out to be more easily legible for humans. The NGS Palomar Sky Atlas was available in glass or paper editions for around $40,000, and it became an indispensible reference for astronomical observers worldwide, as well as a primary research tool in its own right, for over thirty years. But the advent of digitized surveys; the discovery of non-optical spectra such as gamma rays and X-rays; and the expansion of space-based observation platforms have rendered analogue photographic prints like the NGS-POSS scientifically obsolete. In the spring of 1960, engineers from GT Schjeldahl, the Minnesota-based contractor for Echo IA, conducted an inflation test in a World War II-era dirigible hangar in Weeksville, North Carolina. The orbiting satelloon’s primary purpose was to be easily visible around the world to the naked eye, but NASA did not want anyone to miss Echo’s awesome presence on the ground, either. The large NASA banner suspended in the vast space indicates that the satelloon was there not just to be tested, but to be photographed. 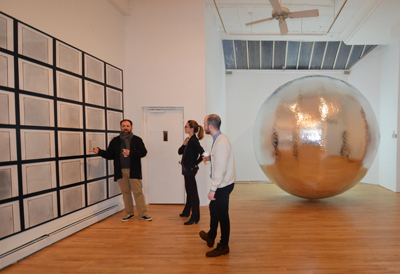 In the Weeksville pictures, Echo at first seems like a classic example of the early Space Age satellite vernacular: minimalist, spherical, and metallic. Then one notices the photos’ contextual details--the hangar doors and girders; a parked truck; and, most remarkably, two men, one seated on a folding chair, just looking at the thing--which reveal Echo’s almost comically immense scale. Echo’s size matters not just for its image--its iconic presence on earth as well as its visibility in the heavens. It also accords with the United States’ new, official predisposition to view space as a site for asserting its political, military, and cultural dominance. Echo was a funhouse-mirrored reflection of the reactive, fraught, and bombastic political uncertainties of post-Sputnik America. This is President Eisenhower speaking. This is one more significant step in the United States' program of space research and exploration being carried forward for peaceful purposes. The satellite balloon, which has reflected these words, may be used freely by any nation for similar experiments in its own interest. Long after its launch, Echo remained in the public eye thanks to the publication of weekly orbit schedules and tips for taking time-lapse pictures at satellite viewing parties. The first photo of Echo IA in orbit was taken within hours of its launch by a Northwestern University student named Jonathan Blair. Many more followed as professional and amateur photographers alike submitted images to their local newspapers, which circulated them through wire services and magazines. In these photos of the night-time sky, one star, the “American Star,” moves against the rest, leaving its glowing trail across the sky. Though Pierce’s practical communications relay experiments at Bell Labs provided the rationale for Project Echo’s existence, they amounted to just a few proof-of-concept demonstrations: some long-distance phone calls, a transmitted photo, a few songs. The greater impact came just as Von Braun had imagined: from the clock-like spectacle of this “American Star,” which helped to ease Americans’ Space Age insecurity; to propagate the U.S.’ “Open Sky” policy against a feared Soviet militarization of space; and to normalize the concept of living with satellites always overhead. Since the 1960s, expansion of manned space flight and human activity in space drew public attention away from the rapid proliferation of satellites—except, ironically, among astronomers. Efforts to update NGS-POSS were complicated by the increased "contamination" of their astronomical observations by satellites. An analysis by the Royal Observatory, Edinburgh, found that sky surveys (including a POSS II) made after 1980 had more than twice the satellite contamination of those made before 1980. (9) And so it is that the first, obsolete Palomar Observatory Sky Survey is also the final photographic portrait of earth’s sky before mankind inserted itself into it. 1. Reid, N. and Djorgovski, S., “The Second Palomar Sky Survey”; Sky Surveys, Protostars to Protogalazies, Proceedings; Caltech, 1992, Astronomical Society of the Pacific, 1993. 2. Minkowski, R.L. and Abell, G.O., “The National Geographic Society-Palomar Observatory Sky Survey,” Basic Astronomical Data, Vol. III of Stars and Stellar Systems, K.A. Strand, ed., U. Chicago Pres, 1963, pp. 481-6. 3. McDougall, Walter A., The Heavens and the Earth: A Political History of the Space Age, 1986, p. 141. 6. Leonard, John Norton, Flight Into Space, Random House, 1953. 8. Gibbons, Howard, Newport News Daily Press, Oct. 30, 1959, p. 1. cited by Hansen, 1995. Greg Allen is a writer and filmmaker based in Washington DC. He has published his art writings in Cabinet magazine and The New York Times, and on his blog, greg.org: the making of, since 2001. Allen published Canal Zone Richard Prince Yes Rasta: Collected Court Documents from Cariou v. Prince, in 2011, and exhibited paintings at both Postmasters Gallery and Printed Matter in 2012.